Sorina's illusions are her family, and together they make up the cast of the Gomorrah Festival Freak Show, but no matter how lifelike they may seem, they are just that - illusions, and not truly real. Or so Sorina always believed... until one of them is murdered. The traveling circus-city of Gomorrah has many inhabitants with unusual skills, but Sorina's is one of the rarest. She is the first illusion-worker to have been born in hundreds of years and as well as producing realistic illusions to entertain audiences every night, Sorina has used her skill to make herself a family of fellow cast members for her Freak Show. The members of Sorina's family each have their own personalities and skills but they are merely illusions, figments of Sorina's imagination, so she's shocked and horrified to learn that they can, after all, be killed like real people. Sorina's father and proprietor of Gomorrah, Villiam, promises Sorina that he will help her find out who is killing her illusions, but with the members of her family slowly being murdered one by one, Sorina also chooses to take matters into her own hands. Unsatisfied with Villiam's theories, Sorina begins a separate line of enquiry to catch the murderer with an infuriating boy she has just met called Luca, who has his own unique skill. He calls himself a poison-worker and people pay to kill him. 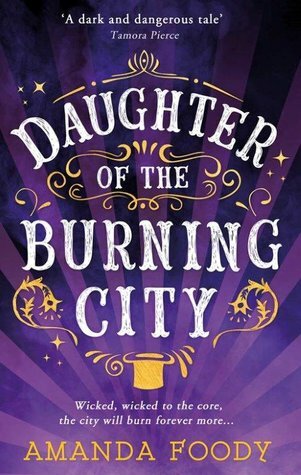 There is a murder mystery at the heart of Daughter of the Burning City but it is not like any murder mystery novel I've ever read before. Partly, this is because the real mystery is not only who the murderer is but how it is possible for them to kill Sorina's illusions in the first place, but mostly it is because of Sorina herself. Sorina is a compelling protagonist. She has no eyes, yet she can see perfectly, and she can make other people see whatever she wants them to see. Because of both of these things she finds it difficult to make friends and so instead she uses her illusion-work to create a family of fellow 'freaks', who she loves as though they were her real family, and who she mourns that way too, even as she worries that most of the friends she has are ones she made up. Sorina is full of these kind of contradictions, which make her feel all the more real as a character. Just because her illusions aren't real, doesn't mean she won't do anything to protect them. Sorina's illusion-work is certainly one of the most interesting aspects of the novel, as is Luca's poison-work, a word he has chosen himself because he appears to be the only one. At first Luca is a little difficult to warm to. He's rude and kind of mean, but as Sorina gets to know him better, so does the reader, and the story avoids the dreaded insta-love trope. If I have one complaint about Daughter of the Burning City it's that I would have liked to have seen more of Sorina's family of illusions, but only because what we do see of them is so interesting: a girl with wings like a hawk, a tree that walks, and a boy with two heads, just a few examples. In the grand scheme of things though, this is a small complaint, as the story is so interesting, fun, and unique, with plenty of twists and surprises to keep you on the edge of your seat, and plenty of characters to enjoy spending time with. Daughter of the Burning City is a very atmospheric read, which is perfect because Gomorrah is a very atmospheric place. Foody's description really brings the reader into this smoke covered traveling city, filled with magic and danger. It's impossible not to imagine walking through the city with Sorina and Luca, not to feel the wonder when Sorina discovers a new part of Gomorrah that she's never seen before, or the grief when she loses one of her illusions. Strange a place as it may be, I would definitely love to visit Gomorrah for real. Although I might pass on Luca's show.